Grand Rapids, Mi. 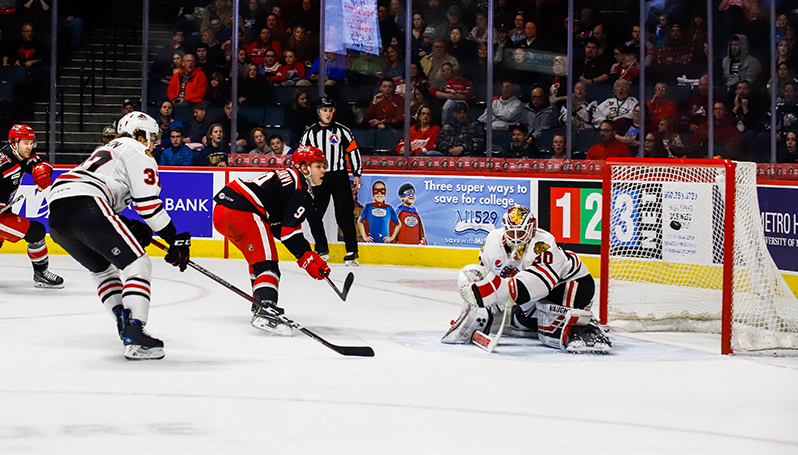 - Griffins goaltender Harri Sateri made 30 saves and Joe Hicketts scored late in the third period to propel the Grand Rapids Griffins to a 2-1 victory over the Rockford IceHogs Monday Night at Van Andel Arena. IceHogs netminder Kevin Lankinen made 26 saves in the loss, allowing two or fewer goals for the fourth time in his last five starts. After Grand Rapids broke the ice in the early stages of the second period, Lucas Carlsson provided the tying tally on a long shot from the point with 4:10 remaining in the stanza. The marker was Carlsson’s fifth goal in eighth games, the most of any IceHogs skater over that span. The two teams exchanged chances for much of the third period, but Hicketts netted the winner with 4:44 left in the game. Hicketts found himself open in the slot after a setup pass from forward Chris Terry, then launched a slapshot past Lankinen. The IceHogs finish the 2018 calendar year with a record of 15-3-3-4, just one point out of playoff contention. NEXT HOME GAME: Jan. 2 vs. Milwaukee Admirals | 7 p.m.
Wednesday night's contest against Milwaukee is a Fas Fuel Winning Weekday. If the IceHogs win, all fans in attendance can redeem their game ticket for a FREE ticket of equal or lesser value to the next weekday home game. It is also a $2 Dog Day. For an additional $2, fans can bring their dog to the arena to enjoy IceHogs hockey. Proceeds from the dog admission will benefit local animal shelters. Hot dogs will also be available for purchase from concessions for just $2.